Head Honcho with Style. 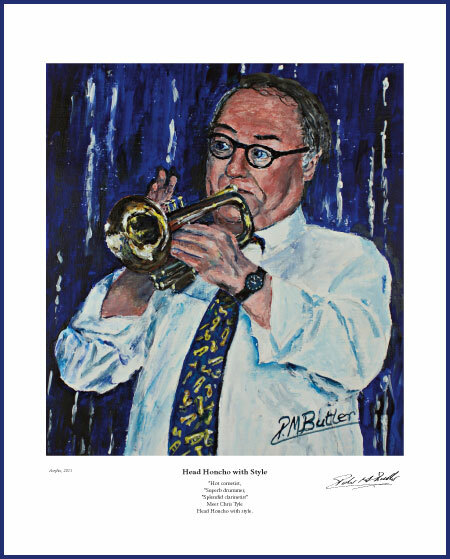 Jazz painting of Chris Tyle on cornet. My jazz photograph capturing Chris Tyle on stage at the 2011 Ramsgate Seaside Shuffle Festival inspired my jazz painting and portrait of his superlative improvisation. Chris Tyle isn’t only a virtuoso on cornet, drums and clarinet, he’s also a noted jazz historian, educator and raconteur supreme. 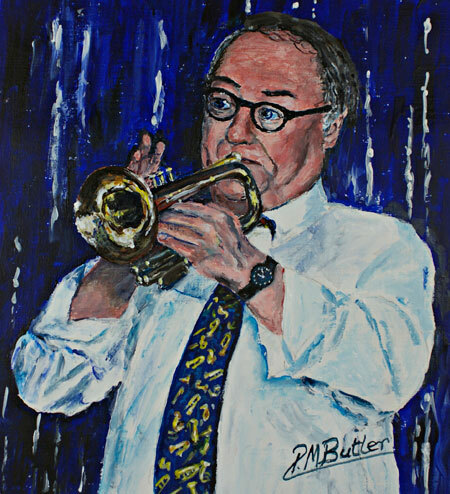 Based in Portland, Oregon, he is a frequent visitor to the UK where he plays with the Gambit Jazzmen so I may yet be privileged to paint his jazz portrait on drums or clarinet. If ever you get to meet Chris, be sure to ask him about the onstage antics of legendary Jack Teagarden’s saxophone “mechanic”.